The most distinctive and well known aspect of Ostrich leather is it’s unique Quill pattern. These quills are the telltale indicators of where the feathers were - and is an indicator of the quality - and therefore the value - of an Ostrich leather product. There are Half Quill and Full Quill variations, with the quality determined from the density of the pattern of the leather. Regardless of whether your item is full or half quill, the methods for caring for Ostrich leather won't change. 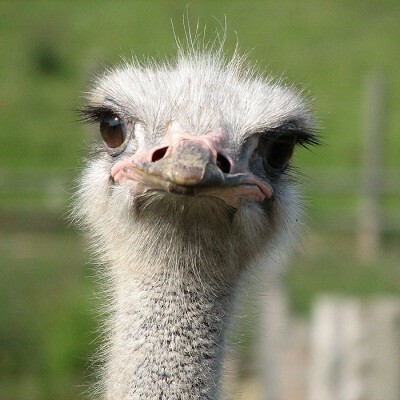 While caring for Ostrich leather is not difficult or complicated, there are some things to consider that you might not need to think about with other products. For instance, Ostrich leather can react to the oils of your skin, and unlike your leather jacket, you are likely to be handling it far more often - holding the handle or strap of an Ostrich leather bag for instance. So for items such as handbags or briefcases, there may be a different type of leather used for the handle, or it may include a cover for this area. Even if no care is taken in this area, this can be considered to be natural wear and tear over time, as you would expect with any leather items. If you do not plan to use your ostrich leather item for an extended amount of time it is recommended to store it in a soft cloth bag or wrapped in tissue paper. Many ostrich leather products are packaged in a small bag when you received it. Hint: Keep that bag and use it as a storage bag when necessary. Most leather products are easy to maintain and clean, and just like most other leather products, when it comes to caring for Ostrich leather you should ensure that you are not using any chemicals or abrasive products that might come in contact with the leather. When you feel it is necessary to clean your ostrich leather product, using a dry, soft cloth is recommended. If your ostrich leather product gets any liquid spilled on it, you must dab the leather with a soft dry cloth to soak up as much of the spilled liquid as quickly as possible. Leather as a general characteristic is very porous and will soak up any liquids that spill on it so timing in removing any spillage is important. Most accidental spillages or marks, such as oils, inks, or other types of liquids should be removed with a slightly dampened cloth as soon as possible. But it should be considered that products with oil contained in them can cause permanent damage to the surface, and should be removed by adding a thin layer of talc over the affected area. This should soak up the oily substance and can be wiped away easily to leave a clean surface. At no time should household cleaning items be used to attempt to remove stains or marks as these are likely to only cause damage. If you spill ink based items on your ostrich leather product can be a tough prospect. Ink, in it’s nature, is a dye. Leather, being a naturally porous material, will soak up any ink very quickly. The longer ink remains on the surface of the leather the deeper it will penetrate into and color the leather. If the ink has soaked into the leather strong products would be required to remove it and this would damage the underlying leather and would necessitate replacement of your ostrich leather item. This Leather Ink Remover product is recommended for cleaning ink from leather products but it is not a sure thing. Sometimes products made from ostrich leather can get water splashed on them. To learn more about how to treat ostrich leather in situations like this, please read our blog article Removing Water Stains From Ostrich Leather. Some items made from Ostrich leather are more exposed to the harshness of the environment than others. For example, a pair of ostrich leather boots will need cleaning more regularly and more thorough care than a wallet or mobile phone case. For heavy use items made from ostrich leather, only approved and tested cleaning products should be used. When cleaning ostrich leather products, first, brush away any dust or dirt from the leather surface, paying close attention to detail areas where dust and grime can collect. A cotton bud can be used to get into these small areas and remove any dust before any cleaning products are applied. Once this is done, apply a thin layer of ostrich leather conditioner, leather shampoo or shoe crème to the surface of the leather and allow it to dry completely. Once the conditioner or crème has dried you can then buff the leather with a soft dry cloth in a circular motion. Never use detergents or chemicals to clean ostrich leather products as this can result in permanent damage to the surfaces of the leather. Testing of any cleaning products, crèmes or conditioners should be completed on a small test area that is out of view, to ensure that it doesn't adversely affect the quality of the product before use. When cleaning, it is important to ensure that any bumps, ridges and creases are cleared of the cleaning agent. Leaving any cleaning products in contact with your leather item can cause visible staining over time. Once you have cleaned your leather product you can use a leather sealer or leather protection product to protect it against dirt and damage. When caring for Ostrich leather items which are not in use it is essential that they be stored in a clean, dry and dark place. Exposure to sunlight for extended periods of time can cause discoloration and fading, just as would be the case with any other leather products. Even artificial light can affect the color of the product, so ensuring that your item is stored away safely will assist in keeping it looking brand new. Caring for Ostrich leather products is simple, and following the steps of care suggested above will help to give you many years of use and enjoyment out of that luxury ostrich leather item that you own.